The above statements highlight the need for more close integration between telecom companies and social media. Here’s how they can utilize the power of social media. How can telecom companies harness social media tools? Social media tools help telecom companies to design campaigns that attract more subscribers and become the market leader. This is done with quick communication through an enterprise social network that allows different telecom marketing members like creative team, media buyer, field sales reps and senior executives to collaborate on vital decisions. As it is done in real time, telecom providers save money and time by reducing the time needed for reviews and approvals. Telecom companies can harness social media to get vital consumer information like service suggestions, questions etc. This will help them design new products and schemes that customers would find attractive. They are already aware of the customer’s needs by monitoring their page traffic, digital campaign’s responses etc. Today, a robust social media presence is not an option, but a must have. Gone are the days when you could depend on traditional mediums of television and print media for public relation (PR) management. With mobile internet browsing increasing at 61% annually, it is imperative for telecom companies to have strong interactive online social media presence. With social media tools, PR teams can filter out news feeds mentioning their telecom company and respond rapidly to any critical situation. The capabilities provided by social media tools negate the need for setting up dedicated resources for complaint and feedback mechanism. They allow you to capture complaints real-time and respond quickly and effectively. Feedback on new services rolled out are maintained and acted upon in future releases. This in turn increases customer engagement. With new features like peer to peer customer support, telecom can reduce complaint calls, thus freeing vital resources. One of our leading telecom clients was able to enjoy a call deflection rate of 44%. Telecom companies can enable users to make and receive real-time updates on orders, tickets, alerts, contacts and billing information. With the help of analytic reports, they can determine spending ratios to support new digital services. Executives can access detailed alerts through social notifications to stay on top of network performance. Subscribers can thus avoid unwanted performance and billing surprises. Telecom companies can reap the benefits of social CRM to boost their subscriber base. 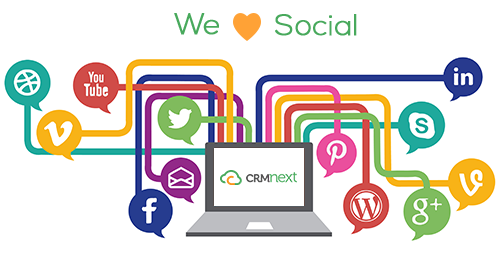 A well designed CRM for telecom will have powerful social tools inbuilt that provides all the above listed features. A telecom CRM blog that is wikipedia for business growth!